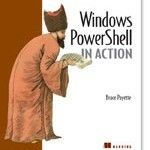 Last week I worked with a PowerShell script where I did a big blunder! I had created a function with the name “Start” and I did not find the reason of why my script failed before at least one hour. Start is one of the PowerShell reserved verbs so stay away from them in your function names or variables! PowerShell statements can be large, and it’s not always practial to enter it on a single line in the console or in a script. In PowerShell, as wel as in most other programming lanuages or consoles it is posible to write statements over several lines.